Bob Vila’s name has been synonymous with home improvement since he helped launch This Old House in 1979. After nearly thirty years of producing and hosting television shows about the world of home design and improvement, he now showcases many of his ideas on his popular website, BobVila.com — a destination also packed with how-to articles and archived episodes. A pioneer of the adaptive reuse movement, Vila helped bring “green” thought to the forefront, and in more recent years he has focused much of his efforts on investigating sustainable building and design. Read on for our conversation with one of the most recognized voices in remodeling as he discusses green building, retrofitting, materials and energy, and how we need to recognize science and the role of government when we talk about policy. Inhabitat: Your website has a lot of green projects and content. Can you tell us more about what you covered over the years that is about sustainable design? Bob Vila: I’m always saying now that I’m 35 years into this that we’ve started calling it “green” and referring to everything as “green this” and “green that” in the last few years, but the basics are still the basics that we’ve always been talking about — at least I’ve been talking about — for many, many years going back to the very beginning of This Old House. Conservation, preservation, recycling, all these things that we were looking at 30-35 years ago in the realm of historic preservation are green. Because obviously rather than tearing down and throwing away, we’re recycling, refurbishing, reusing and saving all those manpower hours, all that energy, and all those materials that initially went into the construction of whatever — whether it was a log cabin or a federal mansion in Virginia. Over the years the things that I’ve been most involved in trying to promote have had to do with energy conservation, and I guess what has opened everybody’s eyes to this was the first Arab oil embargo, and the spikes in energy costs that we saw back in the ’70s. My son was born in the ’70s and a lot of people don’t remember that we were dealing with heating oil that went from 30 or 40 cents to $1.00 and $1.25 very quickly. So issues of energy conservation and smart energy use have been at the forefront of what I’ve been promoting for a long time — coupled with other simple technologies like insulation. And in terms of new home building, that’s kind of an area where I think a lot of people are excited about just due to the possibilities. But there is still much to be said about old technologies, if you will, the stuff as simple as how to site a house so that it takes advantage of passive solar gain. Inhabitat: Existing houses have had a bit of a renaissance, as we have seen people move back into the cities, reclaiming older buildings again. Have you seen a boom or a change in interest for remodeling and reclaiming buildings in the past couple years? Bob Vila: I spend part of the year in New York, and when I’m there I’m always aware of the interest in what the real estate brokers call loft conversions or lofts. But this is still one of the most popular forms of urban housing, not just in New York, but in so many cities. When I was in Chicago a few months ago, and in Houston a couple of weeks ago, you are always seeing former warehouses, former light industrial manufacturing buildings, things that were put up in the 1920s and ’30s prewar that are getting recycled and given new lives as urban loft living. It’s very popular with a younger generation. It’s very popular with people who realize that these buildings very often wind up in parts of a city which are now very desirable because they’re central. I think across the board you are seeing a lot of this. Adaptive reuse is the term that I first used many years ago in doing a project that involved an obsolete building and making it useful. Inhabitat: Can you tell us about that project? Bob Vila: It was the second year of This Old House. We renovated an obsolete and abandoned summer cottage on top of a hill outside of Boston that had been designed by a famous architect Henry Hobson Richardson — one of the great names in American architecture in the 19th century. We made it into an adaptive reuse and restoration project, which ended up providing five dwelling units in the form of a condominium ownership. This is in 1980, so 30 years ago. Inhabitat: So what set the tone for This Old House and your work after that? Bob Vila: Well, I think in all the programming that I’ve done — I left This Old House after 10 years and started the syndicated show Bob Vila’s Home Again and started BobVila.com, which this goes back almost 20 years– in all of these efforts one of the key criteria had to be entertainment. Because you wanted to entertain people so that they stick around and watch, but also give them pertinent information while entertaining. I think I was always conscious of the fact that many of my fans and viewers were interested in more midstream, midlevel, middle-class housing issues that applied to their own circumstances. So more than once I’ve been involved in shows doing projects that have to do with the refurbishing and renovating of a house, whether it’s a shotgun or a Craftsman-style bungalow, or a ranch house or a track house — house typologies that are not antiques. They might only be 20, 30, 40 years old, and not upscale. They’re solid middle-class housing. These are all examples of situations where you can bring in not just fresh coats of paint and interior-design ideas, but fresh technologies to make them work better. And when I say “fresh technologies” I guess very often I’m referring to what today is referred to as “green.” Obviously the simplest thing that we have always promoted is to help people understand the importance of insulation. Nowadays this is well-known, but if someone’s house was built in 1920, it is not the case — they may have had a scattering of something like mineral wool in the attic. But today you can put in products that will give you a huge R-factor and really make your house a lot more comfortable and inexpensive to operate. Inhabitat: Is there anything that’s getting you excited nowadays that you see as taking off or changing the way the building industry does its business? Bob Vila: Well, I think that one of the things that has always concerned me is the inappropriate waste of product. I think the era of everything going to a landfill has changed sufficiently so that the idea of recycling rather than just throwing away has a firm grip on the industry. You see it here walking the streets of Manhattan, where you’ve got so many rehabs and office and residential buildings going on constantly, and you’ll see all of a sudden that you’ve got metal being sorted out very carefully. The products that are being taken out of a building are clearly going to get recycled one way or in another. That’s a big difference just, I think, in the last 5 or 10 years. Inhabitat: We’ve seen, interestingly enough, new builds, where people are putting in old sinks and bathtubs and things that you’d never really have thought about before and obviously they’re coming from yards that have been keeping these materials. Bob Vila: You know what? Architectural salvage is something that goes back 30 years. I always kinda look at ’76, the bicentennial year, as the beginning of an era of real appreciation for antique building elements and antique houses. But that whole concept has evolved to where a lot of these items that we’re talking about in terms of salvage are not necessarily antique. They’re not period. It’s not like, “I’m going out to look for an art deco bathroom suite.” They’re simply secondhand building goods — whether it’s plumbing or its doors and windows or lighting fixtures. They’re secondhand, but they’re nice and they’re perfectly useful. And, again, rather than throwing them away and having them find their way into a smelter or a landfill, let them be polished up and rewired and reused. Clearly one of the big advantages is that many of these things are affordable. The one piece that we have on the website in the green area that involves an architect called Allan Shope, a very well-known architect who made his career really building mansions for millionaires. He got sick of doing that and in the last 5 or 10 years he became very involved in the whole concept of zero-carbon footprints and recycling materials. 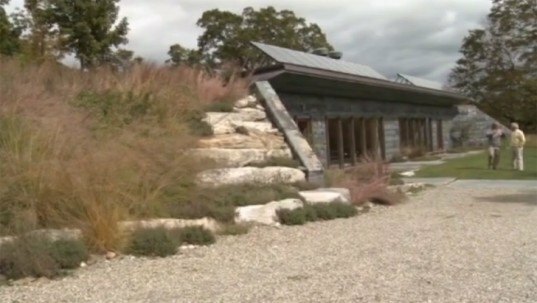 We shot some footage of his own personal Earth-bermed house. He’s a great example of people in the profession examining all these possibilities that involve not just good design from the energy perspective, but also the whole business of recycling and reusing materials that have been abandoned or that have become obsolete, and figuring out how to give it a new life. Inhabitat: Maybe we can pivot a little bit on building materials and talk about the health of buildings and building products. What types of healthy building issues have people had a positive response to? 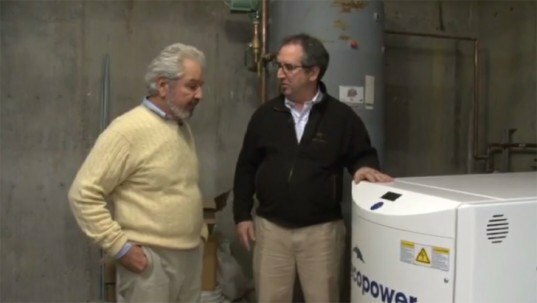 Bob Vila: Over the course of the years in the projects that we’ve been involved with at the residential level we’ve had the opportunity to touch on new products and old products and understand some of the negative health implications, many things, especially man made things. Products like wall-to-wall carpeting come to mind, products that are sometimes noxious to certain people who are sensitive to them. One of the last shows we did for Home Again with Bob Vila I remember learning a lot about by focusing on a healthy environment for babies’ rooms. We essentially developed attic space into a nursery where we helped our viewers understand not just about low-VOC paint, but about the benefits of using natural materials: rubber mattresses, pure cotton throw rugs and drapes and coverings and simplicity in keeping the synthetics out of the equation. That’s something that I have always thought was a pretty good idea, and in terms of industries it has been rewarding to see the paint industry, for example, address health issues in the last 30 years. First with lead-content issues, but then volatile organic compounds and out-gassing and all the other issues. Inhabitat: The green building movement often kind of talks about building in a new way, new materials, new energy systems, new thinking, but we’re also implicitly saying that what we’ve been building now is no good; that we’ve been doing it wrong for a long time. Bob Vila: Well, it’s kind of a double-edged sword, because what we were doing in creating a lot of these synthetic alternatives was trying to make life easier and get better results, get quicker results, get more long-lasting results. We were not taking into consideration that some of these products that were the result of better living through chemistry have in fact demonstrated that living organisms like to be surrounded by other living organisms. In many cases people are hypersensitive to some of these chemically created products. I think people are just that much more aware of the importance of building with these kinds of products. Inhabitat: Lets talk about home energy. 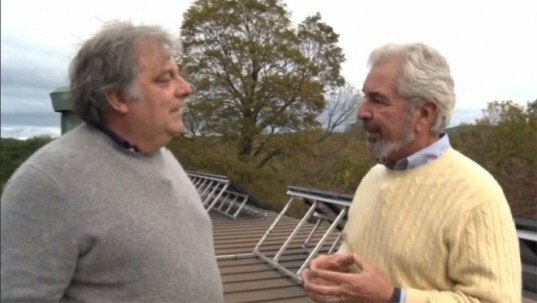 Bob Vila: In terms of sustainable and natural sources of energy, I think wind power is something that is fascinating to see on the individual level. Where I am in the summer in Massachusetts, I’m surrounded by a number of small farms and you’re starting to see wind generators go up. Even though it’s a big initial investment, it’s a great example of people just individually looking at alternative energy sources. In my winter home down in Florida I spend a fair amount of time involved with the town’s architectural commission, which reviews all remodels and all new construction, and I’ve been seeing a great deal of not just interest but of follow-through with solar. What you’re looking at are houses with flat roofs. I’m thinking one in particular historic house, but it was built kind of to look like a Roman villa and it has flat roofs, and it’s on the shore down in Palm Beach, Florida. They are making extensive use of photovoltaics, which will make a difference in the operation of that house, and so a lot of people are considering these sustainable technologies in kind of a different light. It’s not like 10 years ago, where everything was gonna be an ugly photovoltaic array and, no thanks, we’re not gonna do that. Now there are more options, it seems. Inhabitat: Do you see a lot of solar-thermal installations for hot water in Florida? Bob Vila: No. The swimming pool is the best example that comes to mind. The fact is that the business of heating a swimming pool in South Florida applies mostly to the snowbirds, the winter population that leaves in the spring, but the people who are year-rounders very often don’t even consider going into a swimming pool during those cold months. So solar heating of the water for a swimming pool is something that has not caught on as much. It’s interesting because I personally built a pool in Massachusetts when I was raising my family in an old Victorian in Boston. On that property I had a hillside, and I put in a big solar black-panel circulation system that heated the water so that when we opened the pool in June we were essentially bringing it up 5 to 10 degrees relatively quickly without having to spend any money. That was possible, I think, because we had the circumstances of the land. It was on a hillside, it was not visible, and I had the land. A lot of places people have absolutely no land to put this sorta thing on, and if you look at a passive black-panel circulating array on the roof of a little ranch house, it’s not pretty. Inhabitat: It sounds like at least for solar-thermal aesthetics is still a major consideration for adoption, where solar electric you can get away with a lot of different options. Bob Vila: I think without a doubt. I think with photovoltaics arrays you’ve got options now that are less visible and therefore less unattractive to people. Inhabitat: The Cash For Caulkers program kind of fell by the wayside in regards to the amount of awareness of it, and I think a lot of people are wondering what happened to that level of engaging with housing. What do you think the prospect is for people getting more involved with energy retrofits, especially people who work in the industry? Bob Vila: Energy audits help people understand the importance of tightening the house, keeping the drafts out, insulating, updating heating and air-conditioning equipment — all of the above. But I think when you talk about programs in the last couple years that have not gotten anywhere, they’ve been victimized by politics. We’re sadly living in a world where we seem to have bred an enormous amount of Americans who are kind of refusing to understand or accept the importance of science, or the reality of science. And I don’t wanna come down too hard on a lot of these people, but it’s kinda like faith-healing: It doesn’t work. I think that it has to do with people seeing government as being a bad factor in our lives. People have been scared into believing that Big Brother is taking over and ruining their lives so that when there are government programs that have been designed to help people, whether it’s with health or whether it’s with the health and operations costs of their housing, these programs are often rejected because people have been brainwashed into thinking that anything that’s associated with government is inherently bad. Inhabitat: It’s been a lot of work just to get people to understand how important energy use is in the home. What do you see as potentially changing people’s attitudes towards that? Bob Vila: I’ve been working just in the last month with a company called Reliant down in Houston, which is an energy provider. The work that I’ve been doing is to help the community look at what Reliant is offering in terms of energy conservation. A lot of it has to do with installing smart technologies like smart electric meters that provide the homeowner with information and feedback that helps them understand how much energy they’re consuming so that if halfway through the billing period they realize they’ve already used most of their budget for that billing period they can figure out how to cut back. When you’ve got an extended heat wave like the South saw and Texas saw this past summer that can make a difference. People will all of a sudden say, “Damn, maybe I should get one of these programmable thermostats. That way I can let the house get a lot hotter when I’m not in it,” that sort of thing. I think these are initiatives that are both the private sector together with the federal government because these particular programs are made possible by grants that are from the Department of Energy. In this case, this particular company I think is taking advantage of about a $20 million grant. They’ve created something called Innovation Avenue, where they’ve taken a whole block in the historic Sixth District of Houston, and they’ve done wonderful stuff, not just in terms of smart appliances and smart electric meters, but also in helping homeowners get the benefits of energy audits that show them what particular things are gonna be the best payback in their particular situation. A simple example is if they’re in a 100-year-old house without any insulation and they’re really keen on having a photovoltaic array. An architect might help them figure out where it’s plausible to put it so that it works without ruining the look of the historic house. I think that there are a lot of examples of efforts like this that are working, but in the big picture I think we have to worry about a populous that has doubts about the role of government, about truth and about science. Regardless of "Who or What" Bob Villa and This Old House got the HGTV Ball rolling. Bob has a nice way about himself that most people like and he talks very clearly and with respect to others. Why he was pushed off of "This Old House" no one seems to know? "Home Again" of course was a good show, but most of us guys enjoyed watching Bob and others getting those Old Houses that were falling down back on their feet, so to speak. Bring Back BoB Villa. Bob is by far the Best of the Best. I lost all respect for Bob when he started promoting deceptively advertised electric space heaters. I just saw Phil's comment above. We've got quite a different demographic to him - we're targetting mainly cheap conservatories, but despite this, triple glazing is still something we can offer. As an aside, Bob Villa is so incredibly helpful and enthusiastic - he's a real legend! Heavy as it is, triple glazing roof does offer extra insulation extending the time a conservatory can be enjoyed to all year round. Taking advantage of the fact that hot air ascends, cold air descends, we developed a ventilation system to cold down the conservatory in the hot summer without using any energy consuming appliance. We recently made our home "greener" with triple glazing windows in our oak conservatories. Now we can use the space all year round with very limited heating as opposed to having keep the heating on all day just to warm the space up. 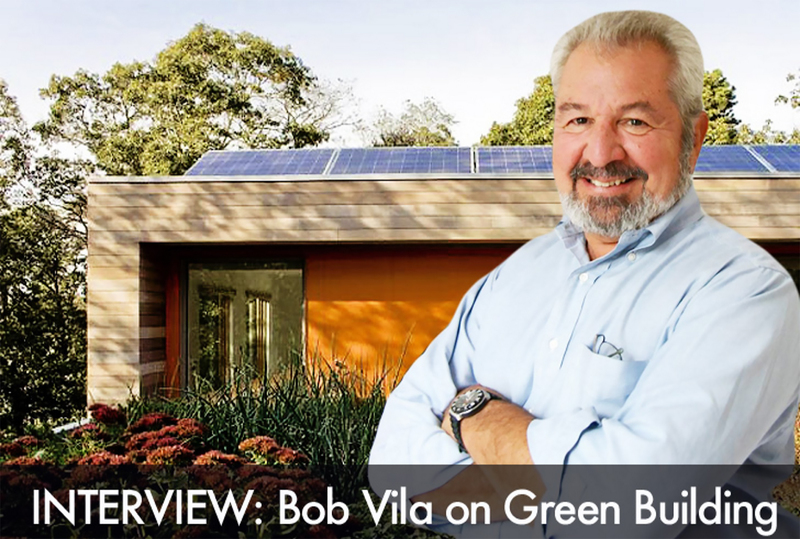 Inhabitat talks to home improvement legend Bob Vila about green building.